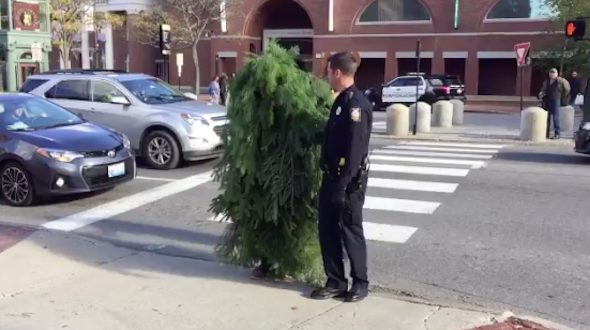 A man who dressed as a tree and stood in the middle of the road ended up being arrested. Photos taken at the scene in Portland, Maine, show the man with foliage all over his body standing in the middle of a pedestrian crossing. When police approached him and told him to move he didn't respond. They eventually persuaded him to leave the crossing, but he was arrested when he walked out into traffic for a second time. Local police revealed the man under the costume was 30-year-old Asher Woodworth. Witnesses say he told officers at the scene that he stood in the road to see how it would "affect people's natural choreography". Woodworth was released after paying his $60 bail. It's still not clear why he was dressed as a tree.